There are very few accessible public photos of AVC Cunningham. Photo courtesy of The UCSD Guardian, April 1, 2002. That’s what Housing*Dining*Hospitality (HDH) Director Mark Cunningham said to a panel of around 100 developers, builders, and architects last November. Apart from picking up traction on Reddit, his comments, published in the Business Section of The San Diego Union Tribune, flew mostly under the radar. At the panel, Cunningham also gave his take on graduate students’ housing needs, saying that they choose to live in specific areas for the quality beer. “Graduate students live in the Hillcrest and North Park area because they want expensive IPAs,” Cunningham said. “Good to know our administration is taking our problems seriously I guess,” said the student who posted the article on Reddit. Another commenter took issue with Cunningham’s dismissal of graduate student needs. When the The Triton reached out via email to Cunningham about the quotes several months ago, he disagreed with how the article presented his quotes and took a different tone. “I want to be clear: students are the antithetical of lazy,” he said. “I would never put a quote in the paper that wasn’t true, and I don’t see how it could be ‘out of context’ considering he only spoke for five minutes or so,” said Phillip Molnar, the author of the article and a veteran journalist at The San Diego Union Tribune. Molnar told The Triton that UCSD staff members emailed him the day after the story came out to ask him to make a minor correction: “the number of UC San Diego students that [HDH] houses is 15,000 – not 1,500.” Molnar said that they never corrected him about anything else or mentioned the quotes were taken out of context in any way. “It’s clear Cunningham didn’t know there was a reporter in the room, but that happens more than you’d think,” Molnar said, expressing regret that he did not follow-up on the story right after Cunningham made the comments. Despite having one of the most influential jobs at UC San Diego, most students have no idea who Mark Cunningham is or even what he does. 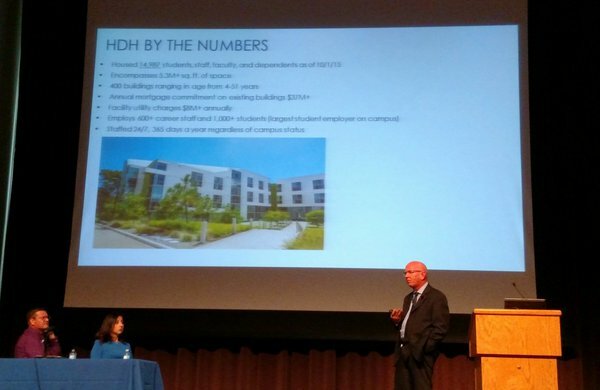 As of 2015, his responsibilities included housing over 14,987 UC San Diego students, staff, and faculty; managing over 5.3 million square feet of facilities contained in 400 buildings; and employing over 600 career staff and 1000 students. More officially and unbeknownst to many of the students government members that do know him, he is also an Associate Vice Chancellor. From his office at the top of the Housing*Dining*Hospitality (HDH) Administrative Complex, Cunningham oversees all housing and dining services, as well as the custodial staff that maintain them. Outside the HDH office windows, parasailers glide over the La Jolla coast. The occasional fly-by plane advertisement greets his morning routine. His office is several stories above Chancellor Khosla’s, which is situated in a single-story repurposed wooden barracks by the Price Center Bookstore. Cunningham, who was there before the HDH administrative building was built, who advocated for its construction, and who has worked in it since, has been on campus for nearly 40 years. The building itself is unmistakable: a multiple-story complex located in Revelle College and off of Scholars Dr. that, with it’s distinctive exterior blue paneling, reflects the San Diego sunset and overlooks the La Jolla coast. One UCSD staff member said that Cunningham only looks at the university and students from a bird’s-eye view. This description is both literal and figurative: his interactions with students are few and far in between. To his credit, Cunningham has done a good job keeping HDH financially solvent. By his account, HDH “provides one of the lowest board options in the UC system while providing the most dining options for our residents.” The organization is also completely self-funded; it takes in no money from student tuition or the state. However, Cunningham is also in charge of an organization that faces frequent student criticism. On a campus plagued by food and housing insecurity, many students see HDH as uninterested in meeting students’ needs. His salary, although consistent with other administrative increases, only compounds this. In 2011, Cunningham made $174,366.68. By 2015 his salary increased $32,785.32 to a total of $207,152.00. “We pledge to meet the needs of our customers with the highest level of professionalism, social responsibility, and service using all of our available resources,” Cunningham said in a 2016 email to The Triton. Instead of simply saying “students,” Cunningham also likes to call students “customers,” the same language used by Education Secretary Betsy DeVos. This attitude is made clear in his emails and is reflected in all HDH communications. Cunningham’s language begs several questions. While he is not the sole representative of HDH, Cunningham is the organization’s director. Who is the “we” that Cunningham is talking about? How do his actions reflect on our university and what should the student body expect in terms of accountability? And what has he done for the students — or “customers” — who he works for? In order to afford housing near the UCSD campus, former Associated Students (ASUCSD) President Dominick Suvonnasupa chose to eat two meals a day instead of three. Because he was late looking for housing, Suvonnasupa said that for the entire first quarter during his term as ASUCSD President, he was essentially homeless. “During first quarter, I just kind of couchsurfed for a while,” Suvonnasupa said. During this time, he said that he quickly found that the burden of being AS president could be a significant drain on one’s personal well-being. As president, Suvonnasupa was instrumental in forming the Basic Needs Committee, the predecessor to The Office of Food and Housing Resources. Suvonnasupa said that he felt a serious disconnect when talking to some administrators on campus about food and housing insecurity. Suvonnasupa said that, despite these conversations with most administrators, two were critical in providing him with a support system: Vice Chancellor Juan Gonzalez, whose office provided the initial support for The Triton Food Pantry; and, perhaps counter to the narrative that he doesn’t care about students, AVC Mark Cunningham. Suvonnasupa said that on an individual level, he felt a lot of support from Cunningham, but he also said that he had a hard time conveying that his problems of food and housing insecurity were not just his own — they are systematic. While other UC’s like Berkeley and Los Angeles were built in walkable communities with access to transit, La Jolla is a coastal community with few practical transportation options. Local commuter busses are often crowded and infrequent. In La Jolla, the average rent per month for an apartment as of 2015 was $2,039. A student parking permit is $183 per academic quarter. Yet, Cunningham sees a long wait list as indicative of a successfully run program. Suvonnasupa said that if you can explain things the right way to Cunningham, he may be more willing to listen. He described the gap between Cunningham and students as generational: from his perspective, Cunningham has a set way he likes to do things from which he never deviates. “He definitely really tries,” he said. “He tries to be more collaborative and he tries to be more open minded. But he was raised in a different era. He’s kind of from this old school mentality.” Ultimately, Suvonnasupa believes that Cunningham “has his heart in the right place;” he just thinks that Cunningham sometimes misses the mark. In response to the growing needs of students on campus, ASUCSD created The Triton Food Pantry in 2015 with initial funding from the Office of the Vice Chancellor of Student Affairs. The pantry, also initially funded by the University Office of the President, the San Diego Food Bank, and Vice Chancellor Juan Gonzalez, serves as a resource for student community members who are in need of food. However, Figueroa feels that this attitude isn’t representative of the entire HDH organization — just Cunningham. In several meetings with campus representatives and student government officials, AVC Cunningham has argued that we shouldn’t have a food pantry on campus, but proposed no alternatives. In 2016, 68 percent of students skipped or cut the size of meals because there wasn’t enough money for food at least once at UCSD. Across the entire UC system, four in 10 students do not have a consistent source of high-quality, nutritious food. Urban Studies & Planning student Katie Hosch was appointed to the new role of Associate Vice President of Food and Housing Resources in 2016, a position created to advocate for and oversee new campus infrastructure related to food and housing insecurity, like the Triton Food Pantry. Photo courtesy of Erik Jepsen/UC San Diego Publications. “We see time and again that there are many folks who live on campus who utilize the food pantry, which means either financial aid isn’t doing enough to cover the appropriate amount for students, or HDH’s prices are so absurd that folks run out of Dining Dollars, so they need another way to feed themselves,” said Hosch. “I personally disagree with Mark, because no matter how much we try and no matter what additional services we provide, there will always be a need for emergency food relief,” Hosch said. On October 26, 2017, Cunningham spoke to ASUCSD about housing solutions and future housing opportunities. In his closing remarks, he made unprompted comments about the food pantry that upset several ASUCSD Senate members. Parajuli said that Cunningham’s behavior and dismissal toward students is infuriating to see from such a high level administrator. Outgoing Muir Senator Sima Navid feels much of the same way. She said that Cunningham phrased everything carefully, but he suggested that ASUCSD should find a way to get rid of the pantry or at least make it unnecessary within the next two years. In addition to employees that work in the administrative office and dining halls, Cunningham is also in charge of a vast number of custodial staff that maintain HDH’s residential complexes and dining halls. A 2012 qualitative study by UCSD Masters Candidate Nancy Madrid on the working conditions of custodial workers at UCSD found that nearly half were female and approximately 57 percent were of Latinx origin. When asked if they could participate in the study, several custodial workers said that they would “rather not get involved,” with one worker saying that she was “outright scared” to speak her mind. “Some even preferred to meet at a separate location than the area where they usually had lunch, for fear of being seen by their supervisors and facing possible consequences for having spoken about their working conditions,” wrote Madrid. In 2010, HDH ordered custodians to make use of the machine in order to more effectively clean dormitories and housing. Management said that the steam machine would be more effective at cleaning areas and more environmentally—friendly; it was neither. When ASUCSD and local unions started advocating against the use of the steam machines, HDH prepared a staff member to advocate for the steam machines during a student government meeting. For the entirety of this process, AVC Mark Cunningham could not be reached by student media for comment. “I just feel the poor salary is one thing, but I think what hurts the workers more is that we are not being treated with respect,” said another member of the custodial staff. In 2012, ASCFME 3299, the University of California’s largest employee union, ended its list of demands by asking Cunningham and Director of Building Services Jeff Wadel to follow the UC Code of Conduct and UCSD Principles of Community in relation to the rights of their workers. On Friday June 8, custodial workers held a protest outside of the HDH Administrative Building, demanding better treatment. Staff inside did not interact with them, and AVC Cunningham did not directly address them. After no small period of conflict, the union’s demands were met that year. Since his arrival in 1979, Cunningham has worked at the University for almost 40 years. In the early 1980’s, he was the Warren College Residence Dean. And in 2001, Cunningham replaced his former boss, HDH Director Larry Barrett, who served in the position for 36 years. University administrators make decisions that shape the student experience and their ability to obtain an education. For students, especially those who are traditionally underserved, access to resources can be the key to being retained at the university and earning a diploma. At a university where students face increasing food and housing insecurity and where some custodial staff feel uncomfortable speaking out against their working conditions, does HDH use all of their available resources to meet student and staff needs, especially those who are underserved? Cunningham might argue that he has done a fantastic job in striving to make HDH’s available resources available for customers. It is apt to wonder, though, if the old idiom remains true; if custodial staff are scared to discuss working conditions and students are consistently asking for changes due to food and housing insecurity… Is the customer always right? Gabe Schneider is the News Editor of The Triton.